For other uses, see Palatinate (disambiguation). The Palatinate borders on Saarland in the west, historically also comprising the state's Saarpfalz District. In the northwest, the Hunsrück mountain range forms the border with the Rhineland region. The eastern border with Hesse and the Baden region runs along the Upper Rhine river, while the left bank, with Mainz and Worms as well as the Selz basin around Alzey, belong to the Rhenish Hesse region. In the south, the German-French border separates the Palatinate from Alsace. One-third of the region is covered by the Palatinate Forest (Pfälzerwald), including the Palatinate Forest Nature Park popular with hikers. With about 1,771 km2 (684 sq mi) it is Germany's largest contiguous forested area, and is part of the Franco-German Palatinate Forest-North Vosges Biosphere Reserve. The western and northern part of the Palatinate is densely forested and mountainous. Its highest mountain is the Donnersberg with a height of 687 m (2,254 ft), situated in the North Palatine Uplands near Kirchheimbolanden. Most of the major Palatinate towns (Ludwigshafen, Speyer, Landau, Frankenthal, Neustadt) lie in the lower eastern part of the Upper Rhine Plain down to the River Rhine. Here the German Wine Route (Deutsche Weinstraße) passes through the Palatinate wine region. It is one of the greatest wine-producing regions in Germany, and in the last two decades has become well known for its numerous prizewinning white and reds of highest quality produced by a number of talented young winemakers. Major rivers include the Upper Rhine tributaries Lauter, Queich and Speyerbach, as well as Schwarzbach and Glan in the west. and the towns of Kaiserslautern (KL), Pirmasens (PS) and Zweibrücken (ZW). Like most of Europe, the Palatinate is part of the oceanic climate zone influenced by the Atlantic, with an average annual temperature of about 10 degrees Celsius. Wet air from the prevailing westerly and southwesterly winds leads to precipitation in the Mittelgebirge ranges, while it warms up on its way further down to the Rhine Valley. Here the temperate weather permits the cultivating of almond and fig trees, stone pines, Mediterranean Cypress, palms, and even some banana species. The lower hilly regions are known for their extended chestnut forests, sometimes referred to as "German Tuscany" in tourist advertising. Formerly a Celtic region, this area was conquered by the Roman Empire under Emperor Augustus in about 12 BCE, whereafter it was part of the Germania Superior province. During the decay of the Empire, Alamanni tribes settled here; their territory was conquered by Francia under King Clovis I about 496. From 511 onwards the area belonged to the eastern part of Frankish Austrasia, that—as Rhenish Franconia—became part of East Francia according to the 843 Treaty of Verdun. From the Middle Ages until 1792, the Palatinate was divided into 45 secular and ecclesiastical territories, some of which were very small. The largest and most important of these was the Electorate of the Palatinate (Kurpfalz), a number of Franconian territories on both sides of the Rhine formerly held by the Counts palatine (Pfalzgrafen) of Lotharingia. By the late 12th century, the Count palatine had achieved the status of a Prince-elector (Kurfürst), becoming one of the seven higher nobles with the privilege of electing the Emperor, as confirmed by the Golden Bull of 1356. In 1214 the Bavarian House of Wittelsbach was enfeoffed with these estates, which they ruled until 1918, together with the collateral branch of Palatinate-Zweibrücken from 1410. They lost control with the reunification with Bavaria under Elector Charles Theodore in 1777. The major ecclesiastical territory in the region was the Bishopric of Speyer. The Imperial city of Landau joined the Alsacien Décapole in 1521 to preserve its status. Nevertheless, it was seized by France after the Thirty Years' War. Other larger regional entities included the Duchy of Zweibrücken and the Prince-Bishopric of Speyer. The Prince-Bishopric held possessions on both sides of the Rhine. For centuries, the Electoral Palatinate and Bavaria maintained dynastic links because both were ruled by members of the Wittelsbach family. In 1794 the Left Bank of the Rhine, including the Palatinate, was occupied by French revolutionary troops. As a result of the Treaty of Campo Formio (1797), the First French Republic annexed the region. In 1798 they introduced a new administrative system with the establishment of departments. Basically, the area of the Palatinate became the Département of Mont Tonnerre, laying the cornerstone of its regional identity today. Minor parts of today's region belonged to the neighbouring departments of Sarre and Bas-Rhin. The French further subdivided the department into cantons, mayoralties and municipalities, and introduced their legal system (Napoleonic Code) and the metric system. Following the defeat of Napoleon at the Battle of Leipzig in 1813, and the capture of the Left Bank of the Rhine by the Allies in January 1814; from 2 February 1814, the region was initially under the provisional authority of the General Government of the Middle Rhine, but, from 16 June of the same year, it was placed under the administration of the Imperial-Royal ("k.k.") Austrian and Royal Bavarian Joint Land Administration Commission (k. k. östreichischen und k. bairischen gemeinschaftliche Landes-Administrations-Kommission). In the main treaty agreed at the Congress of Vienna in 1815, and dated 9 June 1815, Article 51 stated that (inter alia), on the Left Bank of the Rhine the former French departements of the Sarre and Mont Tonnerre, except where set forth in the same treaty, were to fall "with full sovereignty" and ownership rights within the overlordship of His Majesty the Emperor of Austria (Herrschaft Sr. Maj. des Kaisers von Oesterreich). Initially, however, joint Austro-Bavarian administration was retained. the canton of Kirchheim-Bolanden, in the district of Alzei. the cantons of Waldmohr, Blieskastel, and Kusel, the latter with the exception of several villages on the road from Sankt Wendel to Baumholder, for which there was to be compensation, by another territorial transfer, with the agreement of the assembled plenipotentiaries of the allied powers at Frankfurt. the cantons of Bergzabern, Langenkandel, and the whole part of the Departement of Bas Rhin on the left bank of the Lauter, which had been ceded in the Paris Tractat of 20 November 1815. These changes took effect on 1 May 1816. In accordance with the prevailing Bavarian administrative structure, the region became one of eight Bavarian districts (Kreise). From 1808, Bavaria embarked on the administrative reorganisation of its territory, creating districts which, as in France, were named after the main local rivers. Thus the new district along the Rhine was given the name Rheinkreis (i.e. the Rhine district), with Speyer as its capital. Of the former French administrative structure, the subdivision of the district into arrondissements, cantons, mayoralties, and municipalities was, in large measure, retained. The Bavarian government also preserved the French legal system (Code Napoléon), giving the Palatinate a distinct legal status within the Bavarian kingdom. At the next lower level, the three former French arrondissements were continued as Kreisdirektion ("Circle", i.e. district, "direction") Frankenthal, Kaiserslautern, and Zweibrücken. Kreisdirektion Landau was, however, a new creation. In 1818 the cantons were merged into 12 administrative districts called Landkommissariat. In 1862 these were designated individually as Bezirksamt. In 1939 each one became a Landkreis (rural district). As his first provincial governor, King Maximilian selected the Privy Councillor (Hofrat) Franz Xaver von Zwack, whose name gave rise to the popular Palatine nickname for Bavarians, Zwockel. In 1832 the Rheinkreis became the focal point of liberal movements. The Hambach Festival, a large gathering near Neustadt an der Weinstraße, proved fertile ground for what came to be considered a milestone in German history. In 1835, King Ludwig I of Bavaria's romantic outlook gave rise to the adoption of new names for the administrative districts of Bavaria by a system of historical allusion. As such, the Rheinkreis officially became the Pfalz (Palatinate). The historic Electorate of the Palatinate was on both sides of the Rhine with Heidelberg and Mannheim as its capitals on the eastern side, whereas the new "Palatinate" established in 1815/16 was solely on the left bank of the Rhine. It included territories that were never part of the historical Palatinate (e.g., territories of the former Bishopric of Speyer, the imperial city of Speyer or Kirchheimbolanden, which had formerly belonged to the Weilburg branch of Nassau). To avoid confusion of the new Palatinate and the former one (and with the Upper Palatinate), the name Rhenish Palatinate (Rheinpfalz) became common and is still used today, but was never made its official name. Another term, that of Rhenish Bavaria (Rheinbayern), though used occasionally, never gained great currency, but can, nonetheless, be found sometimes on older maps. The Bavarian Royal Family tried to encourage Palatine unity with Bavaria by erecting a royal palace in Edenkoben, and through the restoration of Speyer Cathedral under the direct supervision of King Ludwig I himself. The new town of Ludwigshafen was named after the king. Despite these attempts, the Palatinate's representatives to the Bavarian Parliament always prided themselves on the claim that they came from a more progressive region. Indeed, they tried to promote their liberalism, which the French had introduced to the Palatinate, to the whole Bavarian kingdom. German historian Heiner Haan described the special status accorded the Palatinate within Bavaria as being one of a Hauptstaat (main state, i.e. Bavaria) with a Nebenstaat (alongside state, i.e. the Palatinate). In May/June 1849, after the failed revolution of 1848, and as part of the Imperial Constitution campaign, separatist elements wanted the district to secede from Bavaria and establish its own "Palatine Republic". A separatist uprising was suppressed by Prussian military intervention. The Palatinate's union with Bavaria persisted after it became part of the German Empire in 1871, and, indeed, after the Wittelsbach dynasty was deposed, and Bavaria became a free state of the Weimar Republic in 1918. In 1910 the town of Landau was declared independent from the Bezirksamt. After World War I, French troops occupied the Palatinate under the terms of the Treaty of Versailles. In 1920 the western Bezirksämter of Sankt Ingbert and Homburg (Saarpfalz) were separated from the Bavarian Palatinate, and became part of the newly established Saarland which, according to the peace treaty, was governed by the League of Nations. That same year, seven more towns were declared independent from the Bezirksämter: Speyer, Ludwigshafen, Frankenthal, Neustadt an der Weinstraße, Kaiserslautern, Pirmasens, and Zweibrücken. They remain independent to this day. Between 1919 and 1923, during the occupation, there were French-backed attempts at separating the Palatinate from Bavaria and the Empire. On 1 June 1919, Eberhard Haaß, founder of the “Free Palatine Association” (1918), proclaimed the “Palatine Republic”, but failed to occupy the government building in Speyer. On 23 November 1923, Franz Josef Heinz proclaimed the "Government of the Autonomous Palatinate in the Association of the Rhenish Republic" at Speyer, after gaining control of the towns of Kaiserslautern, Neustadt, and Landau, and after the capitulation of the Palatine government. In the following days, several more towns fell into his group's hands. The Bavarian government reacted sharply. It organised a squad under the command of Edgar Julius Jung. On 9 January 1924, Heinz was assassinated while dining at the Wittelsbacher Hof in Speyer. Other leading members of the separatist movement were killed on 12 February, in a shooting in Pirmasens. By then, a treaty between Bavaria and the Inter-Allied Rhineland High Commission (the supreme council of the Allied occupation forces) of January 1924 recognised the status quo and guaranteed that the Palatinate would remain a part of Bavaria, thereby putting an end to separatist attempts. Under Nazi rule, from 1933 to 1945, the Palatinate officially remained part of Bavaria, but was otherwise totally reorganised–it was merged with the Saarland into the Gau Westmark, with headquarters in Saarbrücken. The union with Bavaria was finally dissolved following the reorganisation of German states during the Allied occupation of Germany after World War II. While Bavaria itself was part of the U.S. occupation zone, the Palatinate was occupied by French forces. The French reorganised their occupation zone by founding new states, so that in 1947 the Palatinate was combined with Rhenish Hesse (Rheinhessen), the former parts of the People's State of Hesse left of the Rhine, and the southern part of the Prussian Rhine Province, to form the German federal state of Rhineland-Palatinate. The Palatinate formed the administrative district (Regierungsbezirk) Pfalz. This reorganisation came with smaller losses of former district territory to the Saarland, especially in the area of Sankt Wendel. As part of the 1969 administrative reform, some minor border changes were made in the north. The Diocese of Speyer and the Evangelical Church of the Palatinate still exist today largely based on the historic boundaries of the old Bavarian district of die Pfalz. The Pfalz was initially one of five districts in Rhineland-Palatinate; however in 1968 the district was merged with the neighbouring district of Rheinhessen to form the district of Rheinhessen-Pfalz. 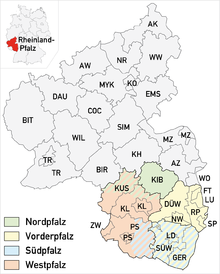 On 1 January 2000 all administrative districts of Rheinland-Pfalz were dissolved. The Pennsylvania Dutch language spoken by the Amish in the United States is derived primarily from the Palatine German language which many Mennonite refugees brought to Pennsylvania in the years 1717 to 1732. The only existing Pennsylvania German newspaper, Hiwwe wie Driwwe, was founded 1996 in the village of Ober-Olm, which is located close to Mainz, the state capital (and is published bi-annually as a cooperation project with Kutztown University). In the same village one can find the headquarters of the German-Pennsylvanian Association. Many more Palatines emigrated in the course of the 19th century, and the great majority of them to North America, so that in the US temporarily "Palatine" was a common designation for German Americans. Johann Heinrich Heinz (1811-1891), the father of Henry John Heinz who founded the H. J. Heinz Company in Pittsburgh, Pennsylvania, emigrated from Kallstadt, Palatinate, to the United States in 1840. Friedrich Trump, the grandfather of Donald Trump, was also born in Kallstadt and emigrated to New York City in 1885. He later married Elisabeth Christ, a former neighbor's daughter from Kallstadt. Arguably the most famous dish in Palatinate is the saumagen, literally "sow's stomach", a dish that consists of a thick, crispy-fried casing (sow stomach) stuffed with a mixture of pork, potatoes, and seasonings. 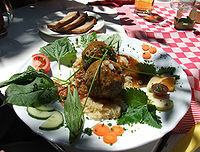 Other traditional meat dishes of the region include bratwurst, Palatinate liverwurst, a blood pudding sausage called grieweworscht ("griewe" are speck (bacon) cubes, so lit. 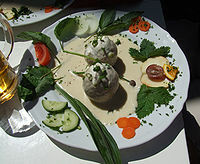 "sausage with bacon bits"), lewwerknedel (Leberknödel) (or lewwerknepp, liver dumplings), and fleeschknepp (Fleischknödel: meat dumplings). Sauerkraut is the typical side dish in all seasons, but especially in winter, as are mashed potatoes and brown gravy. Also eaten are dampfnudels, which can be served with either sweet sauces or side dishes (such as wine, vanilla sauce or canned fruit such as plums, prunes, or pears) or with savory side dishes (such as potato soup, vegetable soup, goulash, or pepper pork). ^ "Rhenish Palatinate - Encyclopedia Volume - Catholic Encyclopedia - Catholic Online". Catholic Online. Retrieved 20 March 2018. ^ "Forschung - Universität Regensburg". Uni-regensburg.de. Retrieved 2012-09-09. ^ Astrid von Schlachta: Gefahr oder Segen? Die Täufer in der politischen Kommunikation. Göttingen 2009, p. 427.